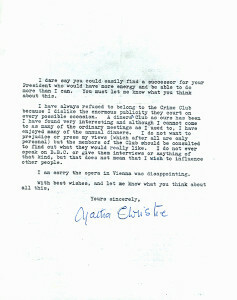 Typewritten Letter Signed, Agatha Christie, two pages, quarto, Winterbrook House, Wallingford, Berkshire, October 23, 1972. To Michael Underwood, Esq., Riverbank, Datchet, Bucks. “I got your letter this morning. As far as my own personal feelings are concerned I have always enjoyed the private quality of the Detection Club which from the time of Dorothy Sayers onward has not included journalists, and has been entirely a Club with no publicity attached to it. “I should not, myself, want to take part in the mock-up of the initiation ceremony, but I think I ought to make it quite clear that I would not like to influence the general feelings of other members of the club who have been members for some time and may approve this suggestion. “I come from a reasonably long lived family have had a grandmother who did not die until 93, and great-aunt who lasted to 88 and a cousin who nearly struck the 100 – (only a week short of it,) and I feel quite prepared for another book this year and probably for a year or two after that as well, – but that concerns my own feelings about my own literary life. Because I have a slight heart condition still and am also slightly lame and cannot stand long, or walk distances; social parties and meetings and those sorts of things are now difficult for me. I think therefore that it might be well if this year I resigned as President of the Detection Club. I thought I could manage the Annual General Meeting this year, but I certainly would not have been able to attend it. “I had a very good time abroad, in the south of France, though I admit that I was considered as a semi-invalid and although I went out with various friends for luncheons I did not undertake any evening engagements. I have come back much better and able to do things, but I have got apparently to go-slow with things, – give up visiting friends where there are stairs to climb, only attend to so many tasks in one day and take certain days off for resting entirely. All rather irritating, – but age is age. “I dare say you could easily find a successor for your President who would have more energy and be able to do more than I can. You must let me know what you think about this. “I have always refused to belong to the Crime Club because I dislike the enormous publicity they court on every possible occasion. A diners’ Club as ours has been I have found very interesting and although I cannot come to as many of the ordinary meetings as I used to, I have enjoyed many of the annual dinners. I do not want to prejudice or press my views (which after all are only personal) but the members of the Club should be consulted to find out what they would really like. I do not ever speak on B. B. C. or give them interviews or anything of that kind, but that does not mean that I wish to influence other people. “I am sorry the opera in Vienna was disappointing. 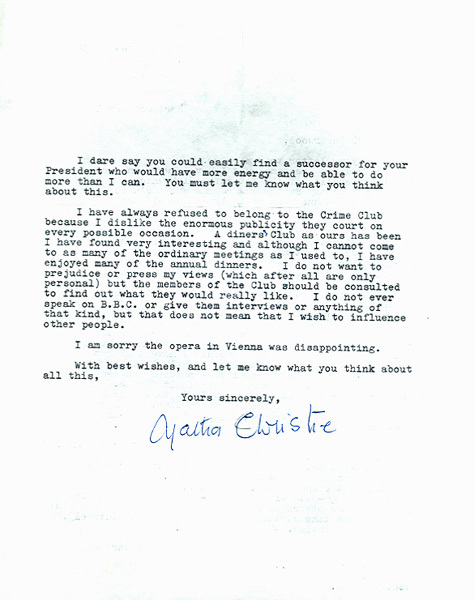 Agatha Christie was 82 years-old when she wrote this letter. In her long career, she wrote 80 mystery novels and story collections, fourteen plays, six romantic novels under the name of Mary Westmacott, and four other books. Her final novel, Postern of Fate, was published in 1973, although additional works, written previously, continued to be published until 1979, three years after her death. The Detection Club, an organization of mystery writers, was formed in the 1930s by a group of British authors including Agatha Christie, Dorothy L. Sayers and G. K. Chesterton. Christie became the club’s president in 1958. Michael Underwood, the letter’s recipient, became a member of the Detection Club in 1959.